THE situation is tense at a gold mine in Inyathi where a person has died after police called to restore order allegedly took over operations. More than 300 illegal panners had allegedly invaded Old Motapa Mine in Bubi District following the discovery of huge gold deposits recently. 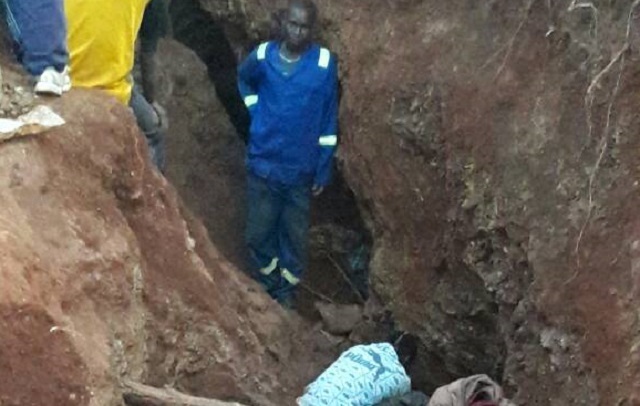 Phakamani Ncube (29) of Village 4, Lubanda area, under Chief Mtshana in Inyathi died while his three unidentified colleagues got buried up to their necks after the shaft collapsed when rival gangs invaded the mine on Wednesday last week. Zanu-PF councillor for Ward 8, Herbert Ngwendu said knives are out after police called in to quell running battles among the panners started mining. “It is disappointing that senior police officers (names withheld) continue to be behind rampant illegal gold mining activities in the district. When I informed them about the invasion last week, I expected them to come and maintain peace, law and order at the mine but instead, mining is continuing with panners informing me that police instructed them to work at night and they are allegedly sharing the proceeds. Mining at night in an unsecured shaft is even more risky and dangerous,” he said. A number of illegal panners said the army should be called to the site before simmering tensions boil over. Matabeleland North police spokesperson, Inspector Sipiwe Makonese confirmed the death of one illegal miner but denied that police were now extracting gold from the mine. “I am not aware of any looting by police, and as far as we are concerned, a police team was deployed at the site to safeguard, monitor and ensure there is peace on site. Investigations will be made,” said Insp Makonese. Insp Makonese said the panners were heavily armed with machetes, axes, picks, shovels, hoes and spears. Sources at the mine said a 65-year-old man discovered the gold and mined it secretly for almost a month. “Panners in the area smelt a rat when the old man suddenly started flashing money. He would buy beer for everyone and on one occasion he brought a truckload of beer from Bulawayo — more than 75 kilometres away— which was delivered to his homestead,” said a source. The old man allegedly extracted about 60 grammes of gold every three days and earned more than $25 000 in one month. Cde Ngwendu said unemployment was a contributory factor to the often-dangerous practice of illegal mining. “Because of desperation, illegal miners invade mines and embark on mining on uninspected sites which are dangerous as they usually collapse, trapping them to death. Locals usually don’t benefit from the riches in their area. “As a community, our wish is that Metallon Gold re-opens their mine, inspects it, makes it safe for work and employs people. We need them to take control and ensure security and safety at the mine,” he said. Another gold rush which attracted more than 500 illegal panners started on March 27 in Kenilworth. Last year, 13 police officers were convicted under the Police Act for engaging in illegal gold mining in Inyathi, Bubi District.